As far as their objectives of fine handling and usable road performance are concerned, Ducati have always had their priorities right. Few manufacturers have been able to equal the combination of flexibility and smoothness offered by Ducati's vee-twin engines. Their record in such demanding races as the Barcelona 24-hours at the round-the-houses Montjuich Park is testimony enough to the quality of the Ducati's steering and roadholding. Lamentably, however, poor detail finishing and electrical equipment has given Ducati a reputation for rough quality that will take a long time to wear off. 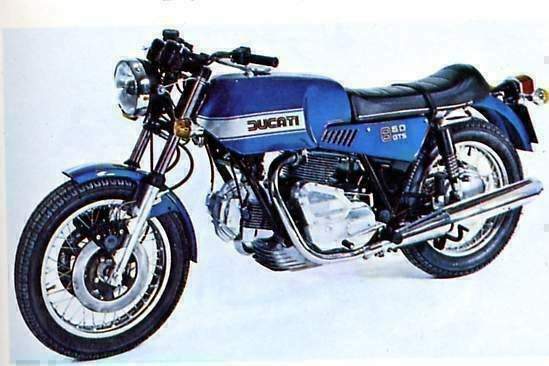 The Ducati 860 GTS, introduced in 1976, was the first indication that the factory was able to offer a machine finished to the same level as the Japanese. It was based on the Guigiaro-styled 860 GT that had proved to be so impractical on the road. The GTS was offered with a more sensible seat and tank and makes a much more agreeable tourer. 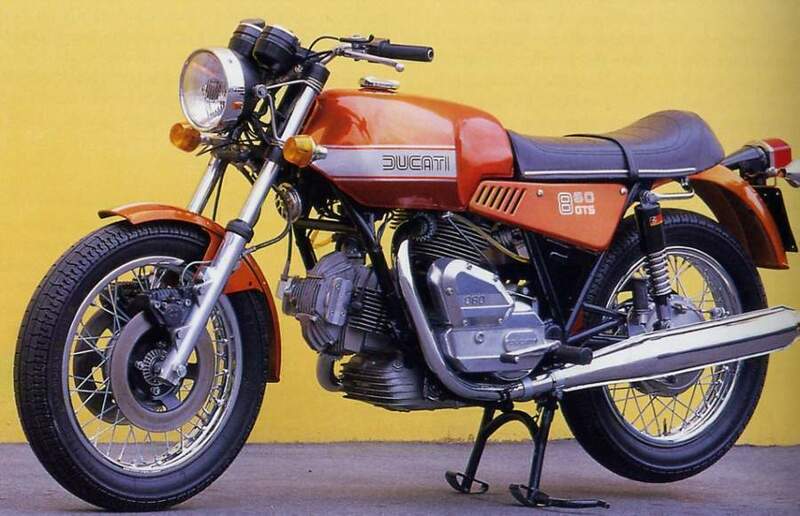 Like all the big Ducatis, the 860 GTS has the vee-twin engine so loved by purists of motor cycle design. Being a 90-degree engine, it offers a pleasant lack of vibration and a slim profile that allows the unit to be slung low in the frame for a low centre of gravity. The frame itself is sensibly made of straight tubing and incorporates the engine as a part of the structure. Triangulated and very strong, it offers tremendous rigidity from the use of thick-walled tubes - a feature that, while it may add a few pounds to the overall weight of the machine, more than offsets this with Ducati's almost legendary high speed handling. Drawbacks of the Ducati approach to its engine design are that the complexity of the bevel and shaft drive to the overhead camshafts make it notoriously expensive to machine and assemble. Fans of the distinctive mechanical melodies made by such a layout will however be pleased to know that the costs of redesigning the valve gear with quieter toothed belts, as on the more recent 500 cc vee-twin, are far greater in the long run than the current production costs and we shall be able to have the pleasure of riding the 860 vee-twin Ducatis for some time yet. Another drawback of the Ducati approach to the vee-twin is that its length limits the minimum length of the machine. 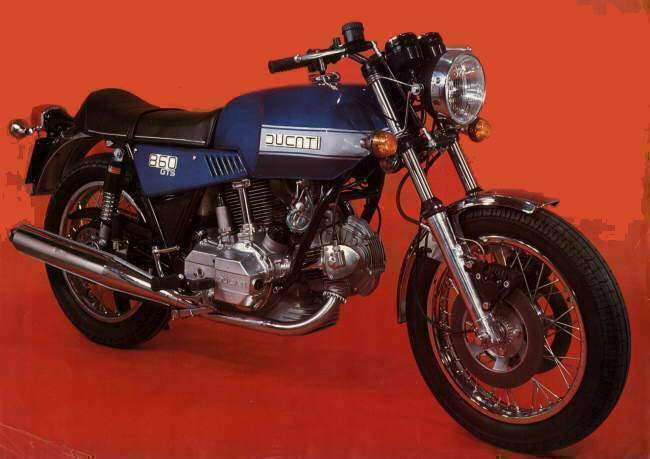 With a wheelbase of exactly 5 ft, the Ducati 860 GTS is one of the longest machines of its type. While conferring a degree of stability during cornering rarely experienced on other machines, such a feature detracts from the bike's manoeuvrability at low speeds and requires a greater angle of lean for a given cornering speed. This means that any clearance advantage offered by the narrow width of the engine unit is more quickly eaten up. As a result, the frame and suspension limits are rarely approached. Ducati have persevered through the eight years since the first 750 cc models were introduced. In 1974, the 864 cc version with a bore and stroke of 86 by 74-4 mm was introduced with newer styling for the crankcases and the option for an electric starter. Demand for a more practical big bore Ducati as an alternative to the Super Sports des-modromic production racer led to the 860 GTS and the more recent 900 Darmah, which has the desmo valve gear of the sportster but with a softer state of tune and more up-to-date styling with Japanese instrumentation and cast magnesium wheels. The 860 GTS is nevertheless a good balance between specification and price, being offered at some £500 less than the Darmah. The most obvious difference between the GTS and its predecessors is the fat fuel tank with a 4 gallon capacity. There is also the low and wide seat. Instrumentation was taken from the obsolete 750 Sport with the British Smiths' clocks mounted on an alloy plate with the ignition lock between them. The electronic ignition fitted to the first eight-sixties meant that the kick starter had to be given a hefty swing to fire up the bike, a very awkWard task with the kick starter so close to the footrests. But the electric starter, which is mounted atop the primary gearcase with the relay under the nearside side cover and connected by a rod to the engaging gears, makes starting easy. It is just a matter of lifting the mixture enrichening lever and punching the little button on the left handlebar console. Once running, everything that made the old sports singles like Velocettes so appealing - a classical and unique blend of mechanical sound and a broad road flexibility - is recalled on the Ducati. Its road performance is superb. While not immensely powerful compared to many 900 cc or 1,000 cc bikes, tractability and low-end punch of the Ducati makes the bike a daunting competitor on twisty and demanding roads. Snapping open the throttles of the 32-mm choke Delorto carburettors is rewarded by an instant kick in the back and this happens whether riding through town or whistling along the open road. The top speed of 103 mph with the rider sitting upright is comparable to many bigger machines. Although the bike has an excellent five-speed gearbox, with a very pleasant change mechanism, there is very little reason to use it. Once into top gear there is hardly a circumstance which requires changing down. Even baulking by slower traffic at motorway speeds is seldom frustrating, as with a twist of the right hand the big vee-twin surges forward with hardly a hiccup. Like many similar flexible bikes, the performance is never shown up to apparent advantage in the absolute performance figures. The addition of improved intake silencing and exhaust pipes which emit a deep drone has chopped the top end torque to the degree that there is no reason to rev the unit beyond 6,500 rpm, although Ducati quote the maximum power of around 60 bhp at 7,000 rpm. The weight has crept up too. At 520 lb the 860 GTS is the heaviest ever from the Bologna factory. This shows in the slower quarter mile time of 13-85 sec, with a terminal speed of 97 mph. The test bike had also had its overall gearing lowered by an extra tooth on the rear wheel sprocket. This gave a top gear ratio of 5 04 to 1 and while improving the mid-range response at around 70 mph it lowered the bottom gear ratios to a level that made it difficult to prevent near-uncontrollable wheelspin during standing starts, which lost additional time. For the state of tune of the Ducati, it meant that it was revving at an unusually high 4,700 rpm at 70 mph. Flat out in top gear with the rider flat on the tank at a mean 114-9 mph the engine was revving well over its power peak, at 7,700 rpm. It is possible that Ducati geared the machine with a normally seated rider in mind, but it is also certain that the bike would have been much faster through the timing lights with higher gearing and would probably have been quicker through the quarter mile. On the positive side though was the sheer pulling power of the GTS. Hills would be flattened with hardly any throttle movement, while at the test strip, it accelerated from 40 mph to 92-5 mph in top gear in a quarter mile, the best figure for that test ever recorded for any bike. Ninety-degree vee-twins are appealing for their perfect primary balance. In practice, however, the bigger the engine gets, the bigger are the secondary forces; in the case of the Ducati these act at approximately 35 degrees from the horizontal and at twice the frequency of the engine revs. At high speed this is shown by a buzz through the handlebar and footrests, but it only became bothersome at around 5,000 rpm. Fuel consumption was improved compared with the GT version, by about 3 mpg; this was possibly due to the slightly higher compression ratio of 9-8 to 1. Using four-star fuel, the GTS returned 43-1 mpg overall, dropping to 38 mpg at the test strip while up to 47 mpg was possible with careful riding. Oil consumption was minimal -just as well, as the filler plug at the front of the sump is the worst encountered for undoing and topping up. Ducati are one of the few manufacturers who offer footrests with height adjustment. Set properly they give the Duke a comfortable riding position to 85 mph although the new, lower dual seat lacks padding enough for a comfortable ride over 100 miles. For a vee-twin the Ducati footrests are surprisingly wide at 27 inches tip to tip, and this produces a cornering clearance problem. The very strong frame and taut steering of the GTS encourages brisk bend swinging and the footrests can be worn down very easily without riding hard. The footrests can be raised easily but this produces an awkWard riding position. This is despite very stiff suspension. Short travel Ceriani front forks are used, but these are not comparable in quality to some Cerianis we have experienced. Chattery over ripples, they lacked the lithe feel normally associated with Italian suspension. To lessen the effects of the long wheelbase, radical steering geometry with a 60^ degree head angle and a massive 5 inches of trail are used. The effect is to make the steering extremely taut at speed but heavy around town. Plenty of physical forpe is needed to swing the bike through sharp bends and a degree of precision that leaves little room for mistakes when riding fast. Fortunately the big Metzeler tyres were very grippy in the dry, in strong contrast to their apparently poor wet grip; a problem that was tracked down to misaligned wheels. On most other bikes this can be corrected at the rear-wheel chain adjusters, but the Ducati has eccentric adjusters at the swinging arm mount which preclude anything but frame straightening. Double discs are now offered on the GTS front wheel and the power provided is phenomenal. In fact these brakes were so powerful that the 30 mph stopping distance tests rEVOlved around a trick to prevent the front wheel locking. The rear drum was merely average by comparison. It faded in normal use and was insensitive in an emergency. The Ducati's electrics are a vast improvement on previous models. The transistorised ignition is maintenance free and the voltage control unit for the massive 32-amp-hour battery is electronic too. The 60-watt quartz-halogen headlamp sends out a strong, safe beam that is ideal for quick night riding. Only the awkWard hand switches and the microscopic light-emitting diode warning lamps spoil the electrics. The tools, which sit in a plastic tray under the lockable seat are adequate for most of the tasks required, but the spanners were brittle and broke if used clumsily. Faults were confined to a speedo that failed towards the end of the 700 mile test and some corrosion on the main fuse that blacked out the bike. There was no prop stand but the main stand was easy to use. The Ducati 860 GTS has such a pleasing character that grows on you that owners find it easy to ignore the poor chrome and soft paint just for that thundering silky urge of the big vee-twin with the cantering exhaust note.